EXCLUSIVE - It happened on Friday night, July 14,three days into the Second Lebanon War. An Iranian missile fired by Hizbullah hit an Israeli Navy gunship off the shores of Beirut. Four soldiers were killed in the biggest blow to the IDF's morale during the 34-day conflict. An inquiry into the incident later revealed a line of failures. Up until now, the IDF has prevented the publication of detailed photographs of the incident. 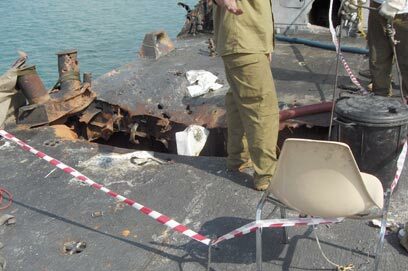 Now, 15-months later, exclusive images from the deck of the ship have been obtained by Ynet. For the first time, the hole that was left near the helipad on the advanced gunship, and the damage the missile caused, can be seen. 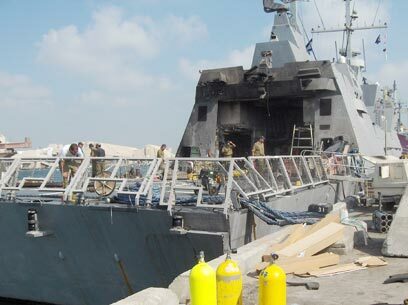 The photos show that the fire that broke out on the Hanit naval ship, left much of it charred, including the command bridge. 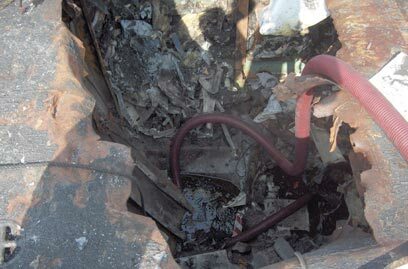 The deck of the ship also suffered great damage and the heavy metal was bent and burnt. The hole that the missile left in the soldiers' sleeping quarters was especially deep and reached the bottom of the ship, causing much harm and casualties. Despite the major disaster, which took four lives, the images show that the missile fired by Hizbullah could have caused far worse damage if it had hit the center of the ship or one of the ship's central systems. The pictures, published here for the first time, were taken three days after the attack once the ship had arrived at Ashdod port for repairs. The IDF preferred not to show images of the damaged ship, and up until now have only been publishing photos of the ship at sea on its way to Ashdod, where the signs of the damage caused could not be spotted. The decision not to publish the pictures was made out of considerations that viewing such images could be too difficult and make the incident, which was considered one of the most serious incidents during the war, even worse. Last week, Navy Commander David Ben-Ba'ashat ended his term after three years in the position. Ben-Ba'ashat chose not to stay in his post for a fourth year, in the shadow of the Hanit ship incident. The ship was repaired over a period of many months and was recently put back into operation. The crewmen have undergone workshops with professionals, including psychologists, in order to be able to deal with the incident that caught the military and navy off guard. Following the incident, changes were made in the army's decision making procedures regarding intelligence evaluations of weapons held by the enemy, to ensure that such an tragedy never happens again. See all talkbacks "Exclusive: Photos of navy ship hit during war revealed"